There are a total of 14 of the Destination’s hotels in eight of the categories appearing in the Best Rankings 2017 for hotels in Mexico and the Pacific Coast. 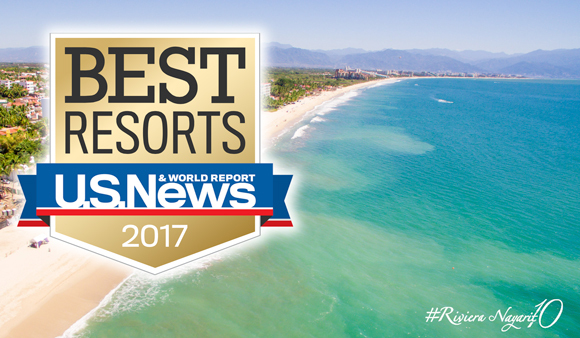 The US News website portal has published its traditional Best Rankings 2017 in its travel section, ranking the best of the tourism industry and the Riviera Nayarit hotels were recognized for their high quality in Mexico and the Pacific Coast. US News grades the best hotels based on the opinions of recognized experts in the tourism industry, guest opinions and the quality parameters of the hotel in question. Beginning with a wider perspective, the first category is Best Hotels on the Pacific Coast, with a list of 68 establishments, 14 of which are in the Riviera Nayarit. Among the first 15 is St. Regis in 3rd place, Four Seasons in 4th place, Grand Velas in 7th place, Hard Rock in 13th and Marival Residences in 15th place. In the category of Best Hotels in Mexico only St. Regis (10) and Four Seasons (11) were among the top 15; there are four more destination hotels further down the list, which contains 388 hotels total. In the category of Best All-Inclusive Hotels in Mexico, Grand Velas led the way among the eight destination hotels on the list, ranking in 4th place out of 127; the closest runner up was the Hard Rock in 12th place. The remaining categories do not include a descending order and only include the classification of the selected hotel. The categories consisted of Best Family Hotels in Mexico, Best Wedding Hotels in Mexico, Best Spa Hotels in Mexico and Best Pool Hotels in the Riviera Nayarit; there are seven Riviera Nayarit hotels in each one. Finally, there were six destination hotels in the category of Best Hotels With Free Breakfast in Mexico. Other winners include: Villa La Estancia, Villa del Palmar, Iberostar, Dreams, Riu Pacífico, Grand Sirenis Matlali, Royal Suites By Palladium, La Tranquila and Garza Canela; the latter was the only one from San Blas.